The US President is in Italy today for the G7 Summit. THE ACTIVITIES OF President Donald Trump’s son-in-law and senior aide Jared Kushner have come under FBI scrutiny as part of the probe of Russian interference in last year’s presidential election, US media reported yesterday. Although it is unclear whether Kushner is a main focus of the probe, he is under investigation for the “extent and nature” of his interaction with Russian officials, The Washington Post reported, citing people familiar with the matter. NBC News, citing unnamed US officials, also reported that the FBI is looking at Kushner but emphasized that although investigators believe he has “significant information relevant to their inquiry,” it does not mean they suspect him of a crime. The news is sure to rankle Trump, who was in Italy for a Group of Seven summit, accompanied by his top aides including Kushner. Kushner held meetings with the Russian ambassador to the United States and a banker from Moscow in December, the Post said. The banker, Sergei Gorkov, is chairman of VneshEconomBank, a state bank under US sanctions since July 2014. Kushner initially failed to declare the meetings on forms to obtain a security clearance to serve in the White House. His lawyer later said it was a mistake, telling the Federal Bureau of Investigation that he would amend the forms. Kushner, who is married to Trump’s daughter Ivanka, is the only current White House official known to be considered a key figure in the probe, which is targeting other members of Trump’s campaign team. 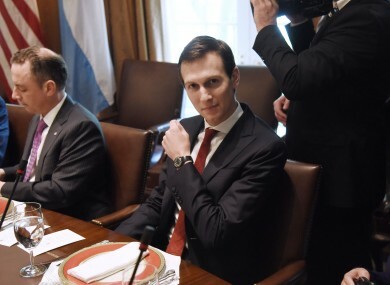 “Mr Kushner previously volunteered to share with Congress what he knows about these meetings,” Jamie Gorelick, one of his attorneys, said in a statement. He will do the same if he is contacted in connection with any other inquiry. But NBC noted that Kushner was not considered to be in the same category as either former Trump campaign manager Paul Manafort or sacked national security advisor Michael Flynn, who are considered “subjects” of the probe. Investigators are looking into possible financial crimes in addition to possible collusion between the campaign and Russian officials, the paper reported on yesterday. The probe is headed by former FBI director Robert Mueller, appointed special counsel with broad powers to investigate Russian election meddling and possible collusion with the Trump campaign after the president sacked FBI director James Comey, who was heading the investigation, earlier this month. Comey’s firing, together with Trump’s reported repeated efforts to persuade senior politicians, justice and intelligence officials to help push back against the probe, have brought accusations that he is obstructing the investigation. Trump has repeatedly denied any collusion between his campaign and the Kremlin, amid accusations from US intelligence that Russian President Vladimir Putin orchestrated a sweeping campaign to tilt the vote in the Republican’s favor. The president last week declared himself the victim of the “greatest witch hunt” in American political history. This week, former CIA director John Brennan revealed that intelligence chiefs had been looking into suspicious contacts between Trump campaign associates and Russian officials since mid-2016. President Trump will meet world leaders today at a G7 summit in Sicily. Read: Fake news, Facebook and Donald Trump: Why do just a quarter of Irish people trust the media? Email “Donald Trump's son-in-law under investigation for 'extent and nature' of Russian links”. Feedback on “Donald Trump's son-in-law under investigation for 'extent and nature' of Russian links”.